Burbank, CA – Avatar: The Last Airbender cartoon series, a production of Nickelodeon Studios, has been one of the most influential animated series in American history. Originally aired from 2005 to 2008, it is a combination of Chinese kung fu, friendship and unity. 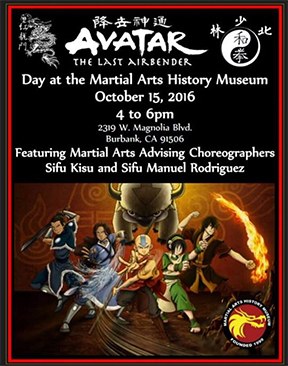 This Saturday, October 15, the Martial Arts History Museum will be paying a special tribute to this series by featuring two of its prominent actors; Sifu Kisu who played Master Piandao as well as creating all the movements for Aang and Manuel Rodriguez, who did the choreography for Toph. Avatar, which later branched out to a second series entitled Korra, became a phenomenal hit in the martial arts world. Filled with class style Chinese kung fu movements, Asian philosophy, feuding nations and comedic situations, the series brought new awareness to different Asian cultures and inspired a new generation. The show was created by Michael Dante DiMartino and Bryan Konietzko. “In just a few seasons, Avatar was able to wonderfully highlight martial arts philosophy and it had a bigger effect than even the producers realize. Although focused on Chinese culture, it branched out into Japanese and Korean philosophy as well. It was a good, clean show that we here at the museum are proud to recommend,” says museum president Michael Matsuda. For this event, the museum will feature two of its prime characters, Sifu Kisu who actually created all the movements for a majority of all the characters including Aang, Sokka, Katara and Zuko will be joined by Manuel Rodriguez who created the earth-bending movements for Toph Beifong. There will be video clips along with a question and answer period and an explanation of the show. This is a FREE EVENT for the public to enjoy. Doors open at 3 pm and the event begins at 4 pm to 6 pm and will be hosted at the Martial Arts History Museum at 2319 W. Magnolia Blvd., Burbank, CA 91506. The museum is a registered non-profit 501(c)(3) organization and is fully supported by donations, memberships and sponsorships. For more information, visit www.Mamuseum.org or call (818) 478-1722.